We read a blog post about roping and horses that makes some good points. The authors, Mark Wray and Christine Hamilton, give some young AQHA ropers some good advice. If you want to work on your roping, then slow down and work on your horsemanship and the fundamentals. We don’t pretend to know a lot about roping, but as to horses the advice is first-rate. The basics for a horse come slowly if you want a good result. The basics also require reinforcement periodically to avoid bad habits developing. Whether roping, trail riding, or dressage, horses like people will start to cut corners if you let them. Occasionally returning to training and doing it slowly helps watch for those areas the horse is starting to get lax. Wray and Hamilton also remind young ropers that your horse needs a break from time to time. We could not agree more. If you want to see performance out of your horse, you need to provide some variety in your routine and let the horse have some fun. A nice long ride out in the country once in a while will do wonders for your horse’s attitude and renew his mind. Remember with horses fast starts slow and just like the rest of us; a horse needs a break from the same old routine. There are some lessons and training that just can’t be reproduced. It comes from experience and simply doing the job. You know, the events that take place when life just happens. Chex, one of our AQHA quarter horses participating in the two-year training program had one of those lessons this week. He dropped his back legs into a sink hole and got stuck while being ridden. It would be doggone hard to replicate a hole suddenly opening in the ground and the back-end dropping in it. We’ve been blessed with quite a bit of rain and much of it has started to soak into the ground. Having been so dry the last two years, some of the earth apparently fell away underneath. Chex’s back legs dropped down up to the hock. He handled it pretty well and didn’t get real excited. It turned out his calm, laid back personality paid off for him because his left leg was stuck. Unable to climb out by himself, it was necessary to dismount and help pull him out. Part of what makes a good horse is experience. It doesn’t come from running around in circles in a ring. It comes from day in and day out work. It’s life. Chex did well and learned once again to keep his head, not get too excited, and it all works out. Just another day on the job for Chex. He’s making one fine horse! Sometimes you don’t realize the things you take for granted. Words for instance. We don’t think twice about all sorts of words and terms that not everyone uses. It hadn’t really occurred to me until stumbling across a Cowboy Dictionary. It caught my attention and I scrolled down through the list of terms and definitions thinking why wouldn’t anyone know these. But, then it occurred to me that many people in big cities would have no reason to know the meaning of many of the words. If you read this blog and see a word you don’t know, the Cowboy Dictionary might help. Most of the words listed are pretty well-defined and it gives some background if you hear or see a word you that isn’t familiar to you. The author also did a nice job with some photographs to illustrate what things look like. One of my favorites is “cattle guard” If you bounced across as many as we have, you forget how easily the phrase leave someone who had never seen one with a completely different impression. After you think about it, how many people use terms like bosal, hackamore, green broke, chaps, chinks, cold-backed, and a bunch of others. Hope it helps if you didn’t grow up around cowboys. Your Horse Doesn’t Neck Rein? Some of us grew riding horses.We never used two-handed reining that seems to be gaining some popularity today. Ours always neck reined, probably part of that Oklahoma heritage and way of life. In the old days, no one wanted a horse that wouldn’t neck rein. Horses were ridden for pleasure, but also expected to be able to work when needed. If you work on a ranch or use your horse to assist with your job, you need at least one hand for the task. Sometimes you need both hands for the job. Using both hands on the reins just doesn’t make sense from our point of view. We feel pretty strongly about horses that don’t neck rein. They need to be taught. Maybe it’s the old cowboy customs lurking in the deep recesses of our memories, but a horse that can’t neck rein is like a bridle without reins. What’s the point? Our quarter horses for sale in Oklahoma neck rein if for no other reason than so the next generation can text while they ride! We predict hay prices are going down this year. Prices have been high the last two years due to the drought in Oklahoma coupled with the drought in Texas the year prior to the drought here. Today was another really nice rain all morning with the sun coming out late in the afternoon. The lakes and ponds are full and back to normal. It is a true blessing to see the green grass covering the ground. Agriculture runs in cycles and it is time for hay prices to move downward this year and continue down the next year as well. It’s part of the inevitable cycle. If you buy your hay for your horses, we anticipate your feed costs are going to drop this year. Assuming hay prices lower as we expect, then feed prices will decrease some as well. Last year a lot of people shifted to feeding more grain than hay to survive the drought. With it ending, all feed prices will be lower this year. Maybe not the best news for the hay business, but nice for the equine industry. 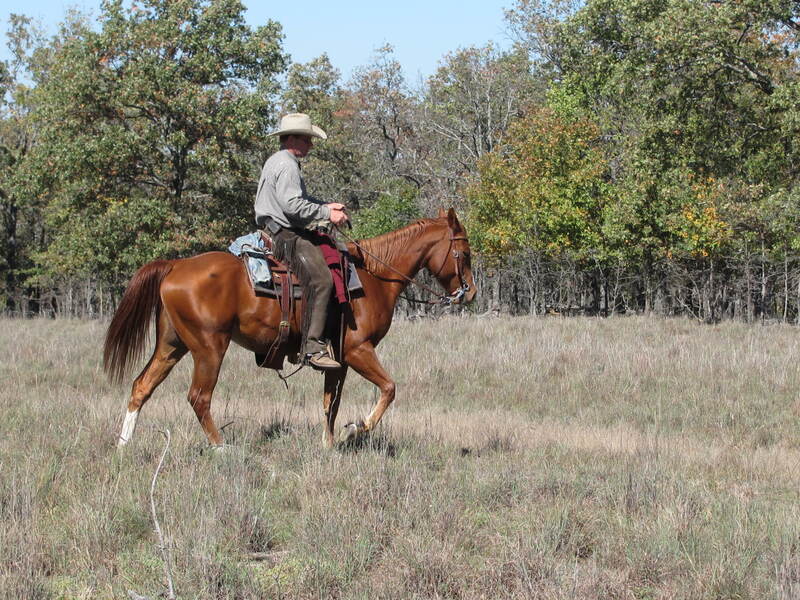 We have blogged about Oklahoma Horse Online before. We like the web page and the list of upcoming events. If you are looking for a trail ride, play day, ranch roping. horse show. or other equine event, it is a good place to look. The webmaster is also willing to link to your group or club giving some visibility. If you haven’t looked lately, just click on the link above. The recent rains have brought us some valuable training tools – water puddles. Yes, water puddles are a fun way to work on control with your horse. As you ride up to the puddle, you point your horse straight at it. Look further down the road with the expectation your horse is going to walk straight through it. He should. Sometimes he won’t and then the training begins. Ride him in a circle back to the start and try again. Often a horse will walk over the water, side pass, and do all sorts of gymnastics to stay out of the puddle. Don’t give up. Some horses take a bit of encouragement and patience. With time some work, you can have your horse going in a straight line right through the middle of them. It is a good exercise to develop the precise steering that you will sometimes need on the trail. It also keeps your horse ready to cross water when you ask. It’s a great way to make use of the rain and work with your horse. The proper training of a horse requires split second decisions and action. Horses, unlike people, don’t have the cognitive ability to associate past actions with the present consequences. Generally speaking, if you want to correct something with a horse, there are two components; timing and appropriate correction. If you get either one wrong, the horse learns nothing. At least, he doesn’t learn what you wanted to teach him. If you delay taking action more than a second or possibly two seconds at most, the horse has mentally moved past the point you wanted to correct. Now when you take action, he thinks you are concerned about what is currently underway. Horses have great memories, but again not the ability to look backwards while learning. For a lot of people, this creates a dilemma. They want to train their horse, have read books, watched videos, and been to some clinics. They try to do what they were taught and fail miserably. Why, because they didn’t have the timing. Let me give a recent example. One of our horses got frustrated in a training session the other day and reared up. He didn’t rear very high, but he was demonstrating he wasn’t happy with the training. Some folks react way to slow to these situations. It requires immediate attention. Otherwise, the horse’s feet are back on the ground before anything is done. Now the horse connects the discipline with an event unrelated to the situation. In this case, the horse was immediately turned to the right and spurred forward. A couple of fast circles making his feet move and then stopped. He was told firmly to just Whoa! Several things happened in less than 30 seconds. First, the horse exhibited an inappropriate behavior and communicated he didn’t like the exercise he was being asked to perform. Second, he was corrected AS IT HAPPENED before his front feet touched the ground. Third, the discipline was suited for the disposition of the horse as well as the misbehavior. Last, he was given 20 seconds to think, reflect, and realize it was all over. Time to move to the next project. Yes, back to the same thing he had just been asked to do, but it wasn’t connected anymore to him rearing up. The reaction of many riders would often violate both of the rules above. First, the reaction would be too slow. Many riders want to “get the horse under control” before figuring out the action to take. It may make good human sense, but not good “horse sense”. The second mistake would be to over-react to what happened. Trust me, I don’t like a horse to rear up, buck, or act up in any way. However, riders wanting to break a bad habit from ever happening again go way too far. They want to “make sure the horse never does it again”. When this occurs, the horse loses respect and starts to resent the training. Thirty days in jail for doing 31 mph in 30 mph zone is outrageous to most of us. The horse can feel the same way if you over-react. The horse was ridden the rest of the day without incident. He did what was asked of him and without complaint. He is a really good horse that did need a quick reminder. He didn’t need to be “taught a lesson”. Teaching horses is all about timing and appropriate correction. It is not about revenge, getting even, or making more out of an event than needed. It takes a lot of practice to do it the right way. Water is important for proper hydration with the weather warming up and the horses still wearing their winter coats. When trail riding or working livestock, our horses drink from the creek or pond or whatever water is available. It is just part of the routine for us. Anyone who saw the horse I was riding a few days ago was probably wondering why I wouldn’t let him drink. It was pretty warm, over 80 degrees Farenheit. There were several times we crossed creeks and my horse tried to stop and drink. I wouldn’t let him. Just dug my heels in his side and said let’s go. As many know who ride with me, I usually encourage my horse to get a drink and believe keeping a horse properly hydrated avoids muscle cramps, colic, and makes for a better safer ride. I still believe these things, but there is one time you need to stop your horse from drinking while on the trail. The last time I rode the horse, I started to notice he wanted a drink at every creek we rode across. Some of these creeks weren’t more than 10 minutes apart and he had gotten a good long drink. I thought I was noticing a pattern so I tested my suspicion. Sure enough, he really wasn’t thirsty, just looking for a nice spot to stand in the water. The rest of the day, he wasn’t allowed to drink from the creek until invited to do so. He probably got a little thirsty once or twice and really wanted a drink, but wasn’t allowed. Bear in mind, I wasn’t going to let him become dehydrated. There’s a difference in not letting a horse drink at all versus deciding when he gets to drink. I don’t want a horse that thinks we are going to stop at every puddle of water so he can stand and day-dream. Doesn’t fit the job description we have. Here horses are expected to get the job done without standing around the water cooler. If you find your horse always wanting to stop at water, make sure it doesn’t become a habit. Problems begin when you stop making the decisions and your horse starts doing what he wants or likes. You are currently browsing the horsesfortrail blog archives for April, 2013.